…for the purposes of pest control! OK…so this flower did so much ‘bloom’ as was constructed and put into service to ward off unwanted birds. It seems like the tender delights of lettuce and broccoli seedlings, nestled in their little baskets in the NFT system, are all too tempting for some flying thief. We suspect the Indian Myna birds as the pigeons are too well fed from the chicken’s feeder tray, and the other birds that frequent our backyard are more omnivore than anything else. We can’t imagine why they would bother with seedlings. And it can’t be the chickens…the system is up too high for them, and they would leave a much more obvious trail of destruction! The NFT system is humming along nicely, with the seedlings now doubling up on their leaves and all transplanted strawberries and other plantlets establishing good root growth that extends beyond the grow media (rock wool) down into the channel and the water. 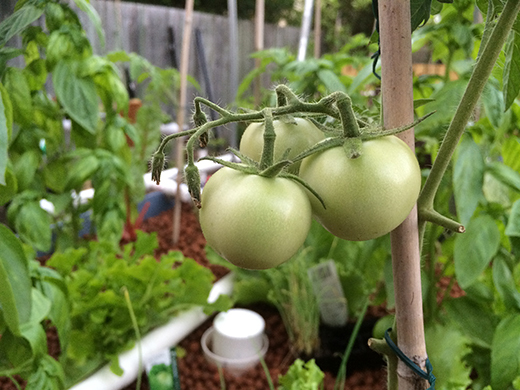 The grow beds are also cycling as they should—I must get to tell you about the cycle and the bell syphons—maybe this week! 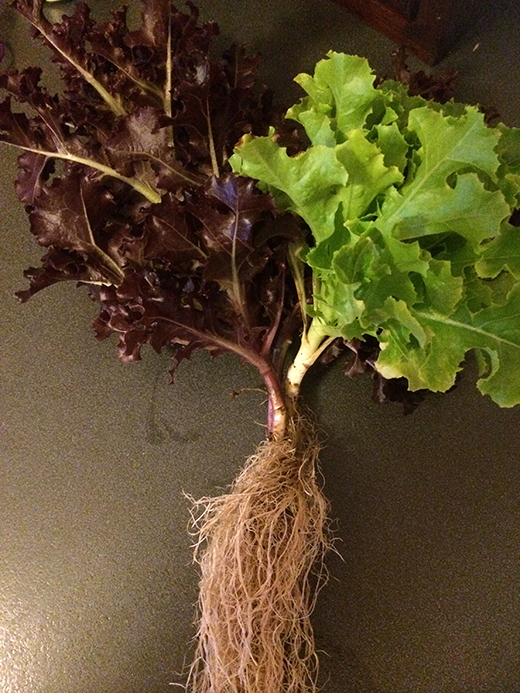 What is amazing, when we pull an entire plant out, like we did today with a lettuce, is the size of the root ball. 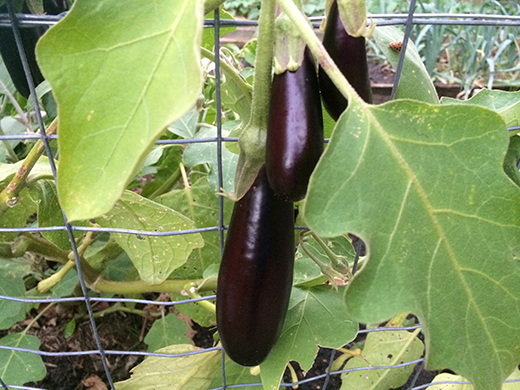 Last but not least, here is a shot of the tomatoes in the grow beds; and evidence from the soil garden (often forgotten) that it is producing well…very happy with these beauteous purple-black finger eggplants! 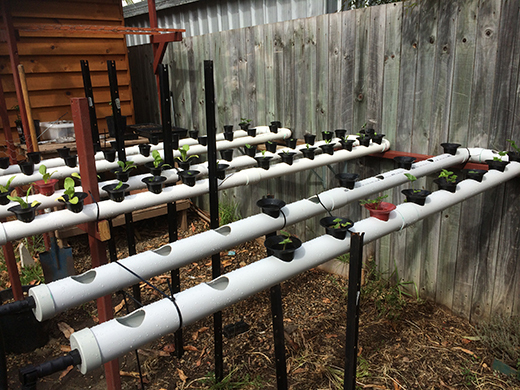 Tags: aquaponics, birds, eggplants, food, fresh food, gardening, NFT, pests, seedlings, tomatoes, whirly-gig. Bookmark the permalink.